1. 1939 England's King George VI eats two hot dogs with President Franklin D. Roosevelt while soliciting American support for the upcoming World War (the NYT's front page headline the next day: "KING TRIES HOT DOG AND ASKS FOR MORE And He Drinks Beer With Them"). 2. 1959 On his jam-packed two-week tour of the U.S. during the Cold War, Soviet leader Nikita Khrushchev samples a hot dog in Iowa (as well as visiting Hollywood and climbing the Empire State Building). 3. 1999 During President Bill Clinton's meeting with Prime Minister Ehud Barak of Israel and Palestinian leader Yasir Arafat, they, yes, eat hot dogs. "Kosher, of course," writes Barry. 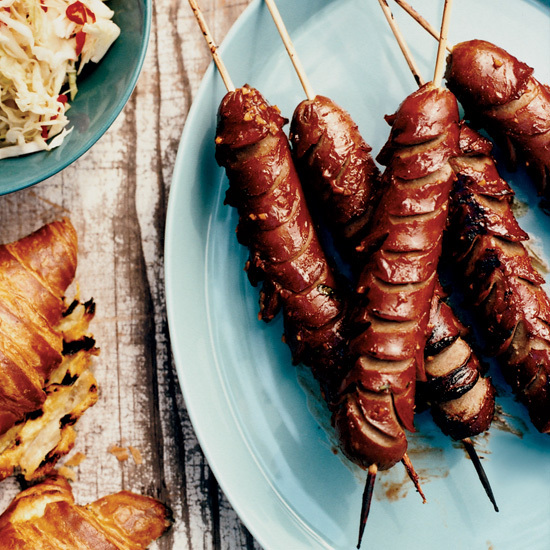 To elevate the hot dog even more, we offer these stellar recipes, including crosshatch hot dogs on grilled croissants (pictured) and bacon-wrapped hot dogs with avocado.